For some homebuyers, landing that dream property can take years. Not so for Natashia Ralphs and Fraser Newton, who knew that the three-bedroom semi-detached house at Carlett Glade in Eastham, was for them - and then made the dream a reality by using Help to Buy Equity. The couple had seen this development being built from the start, as the site is near to Fraser's mother's house, but they were worried the new homes would be out of their budget. However, when they saw the prices of the first properties being released and then looked into the Government-backed scheme, with its 20% equity loan and 5% deposit requirement, they realised the possibilities. Natashia said: "When we found out about Help to Buy, we thought it would be a fantastic opportunity that we just had to grab with both hands. We went down to the show home and fell in love with the house straight away. We loved the layout and it was the perfect size for us. "The location is ideal too, as it is right next to a golf course, which is perfect for Fraser, and it's pretty much central to everywhere, with easy access to Chester and Liverpool. It's also near to where I work in Deeside." 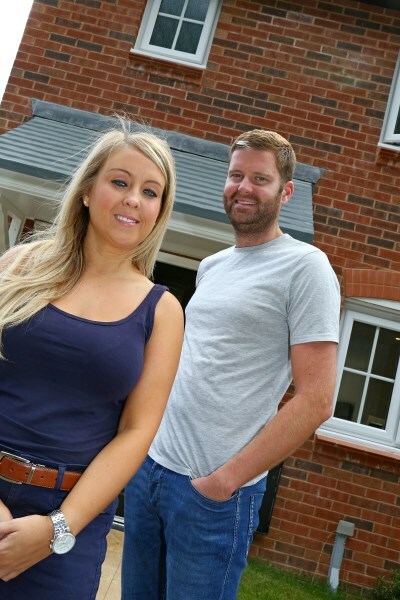 While the house is exactly what supply chain administrator Natashia, 28, and Fraser, a 29-year-old site engineer, wanted, it was the service from Bovis Homes that went beyond their expectations. "We found dealing with Bovis Homes to be great," said Natashia. "You hear all these stories of how getting your first house is so stressful, but with Bovis Homes it was totally stress-free. "We just can't thank Chris, the site manager, Mark, the materials controller, and Anita, the sales advisor, enough for what they have done for us. We feel like they went that extra mile to make us happy and they made our experience of purchasing our very own first home totally stress-free and enjoyable." Bovis Homes Group Marketing Director, Kevin Wilkins, said: "Help to Buy Equity is proving to be an effective home buying solution for many in the region - both first time buyers and existing home owners. Added to the low deposit requirement of just 5% is the 20% Government equity loan, which gives buyers access to the more competitive rates that a 75% mortgage brings. "Buyers in this area like Natashia and Fraser are doing the Maths and deciding that now is a great time to buy a brand new home. I would advise anyone who has been holding back from making a move to take a close look at Help to Buy Equity to see if it's the right option for them."